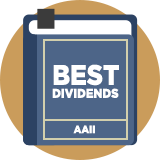 Best Dividends is an income strategy inspired by research into high yield investing by the American Association of Individual Investors. It is based on the premise that a stock's dividend yield will rise if its share price falls. The screen aims to identify which of these value shares is best placed to bounce back in price and be able to sustain dividend payouts. To do this it looks for a 5-year average yield of more than 5%, a track record of dividend growth and a conservative dividend payout ratio. It's an approach that echoes David Dreman's High Dividend value strategy. Dreman found that between 1970 and 2010 high yield stocks beat the market by nearly 1% and outperformed no or low yield stocks by 4%. AAII's screen has seen a 7.3% return since inception (over 10 years ago) vs. 1.7% for the S&P 500.